I’ve got another great book to share with you today, and I promise it’s just a coincidence that like last week’s it’s in rhyme – I’m not going to post rhyming books every single week… probably… maybe… 🙂 But this one is too good not to share. I hope you all enjoy it as much as I do! Opening: “Llama Llama, big big day! It’s a first – a special stay! Brief Synopsis: Llama Llama is spending his first night away from home with Gram and Grandpa. 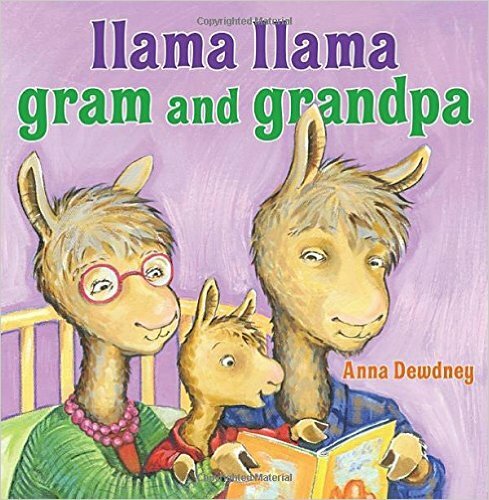 There are lots of fun things to do – a tractor to climb on, a garden to explore, grass to mow, Grandpa’s workshop to try out, and Gram’s food to sample – but what happens at bedtime when Llama’s special Fuzzy is nowhere to be found? Links To Resources: Llama Llama Matching Game, Coloring Book, and more fun stuff; Curriculum Connections Guide for Llama Llama books, free downloadables and printables for teachers including desk plate, poster, and activities.